Air travel is rough enough when everything goes right: security's a breeze, your flight's on time, you've secured a comfy seat, and the skies are smooth. But even the slightest hiccup at the airport or aboard your flight can turn your whole travel day into a hellish nightmare, especially if it requires having to sit on the phone with a customer service agent for hours. But obviously not all airlines -- or airports -- are created equal, and some are far more likely to throw a wrench in your plans when you're trying to skip town. So, how do you know which to avoid and which to seek out? A new study just revealed this year's best and worst airlines and airports around the world, which could do wonders to help you avoid unnecessary travel day headaches. The rankings were created by the folks at AirHelp, a startup that advocates for passengers' rights and compensation. They looked at the on-time performance and quality of service for 72 airlines and 141 airports around the world to determine what earned the bragging rights to top the lists. For the carrier ranking, they considered three factors: on-time performance, quality of service (according to sentiment on a variety of review sites), and a claims-processing score, which essentially measures how well a company handles customer complaints. In 2018, Qatar Airways is considered the No. 1 airline in the world, followed by Lufthansa, and Etihad Airways. Shockingly (or perhaps not), not a single United States-based airline made it into the top 20. Here's how the top 10 and worst 10 ranking breaks down. To select the best airports in the world, AirHelp used a slightly different rubric. They looked at on-time departure stats, and quality of service (sampling online reviews for everything from terminal comfort and passenger facilities to check-in and security). They also took into account general passenger sentiment by looking at how passengers either complained or praised certain elements of their airport experience on Twitter. 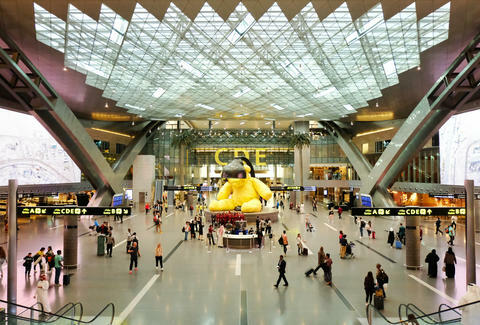 This year, Hama International Airport in Doha earned the number one spot (the Qataris have got it all figured out, apparently), while Greece's Athens International Airport and Japan's Haneda Airport came in at number two and three, respectively. It's worth mentioning that not a single US airport is among the top 30. Here's what the ranking looks like for both top to best and worst airports, of the 141 considered. And while the rankings are certainly a helpful at-a-glance resource the next time you're booking a trip, It's worth considering certain airports are subject to more weather-related delays or cancellations by virtue of where they're located in the world, which could theoretically factor into their position in the rankings. On a generally positive note, AirHelp industry advisor Ashley Raiteri told Bloomberg that airlines and airports are generally making big improvements compared to previous years. In fact, he claims that for the most part, airlines or airports that dropped in the rankings this year did so because the other carriers and travel hubs are just doing much better. “What we mostly see is improvement, to be honest,” he said. Then again, next time you're feeling pissed off by seemingly random flight delays or a generally negative air travel experience, just remember: it could always be much, much worse.